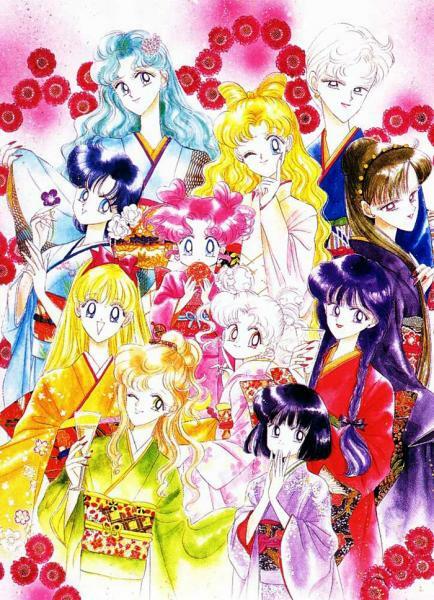 Strawberry Kimono: Senshi in Kimono? Back in my cosplaying days I briefly entertained the idea of doing Sailor Mars cosplay in yukata. 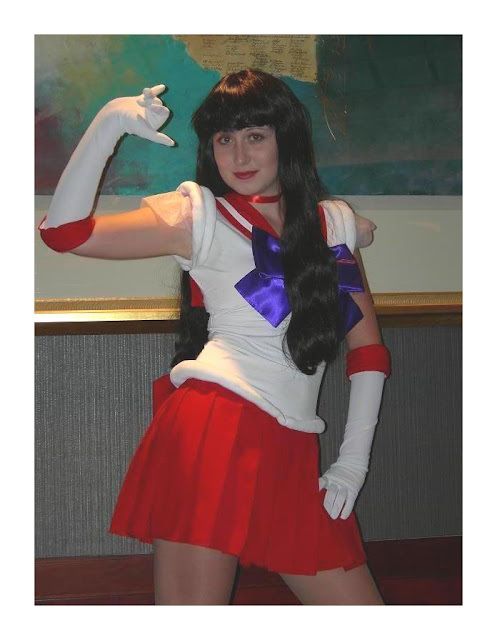 At the time, I was cospalying Sailor Mars, and had several interested friends, but over time I figured out that I don't really like yukata, and then I pretty much stopped cosplaying Sailor Mars. 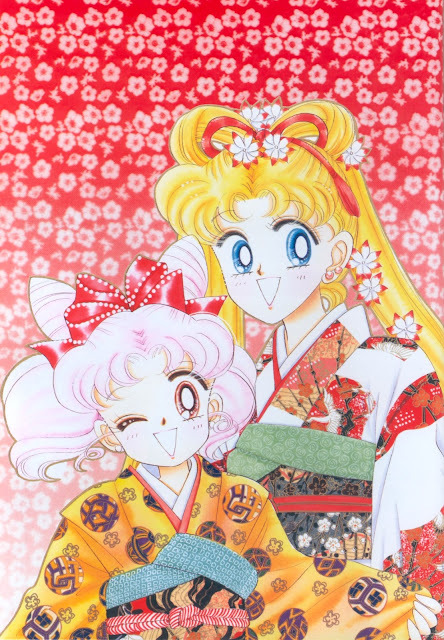 Fast forward almost 6 years after this picture was taken, and now I'm back to wanting to cosplay Mars in kimono. 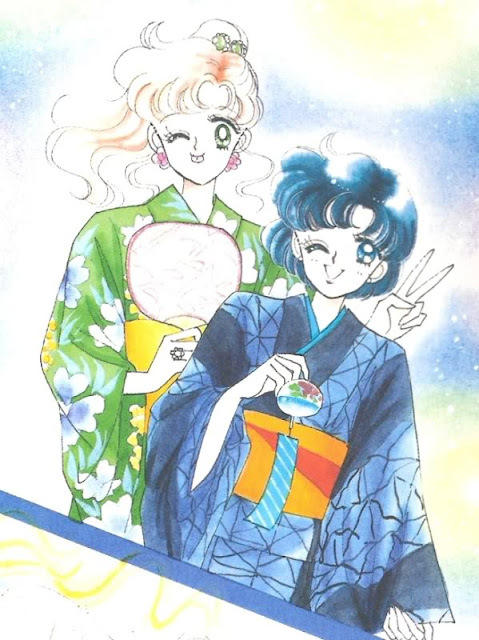 Except I no longer want to try and stay true to the actual illustrations, but instead I want to use my own kimono and style it as I think Rei would wear hers. 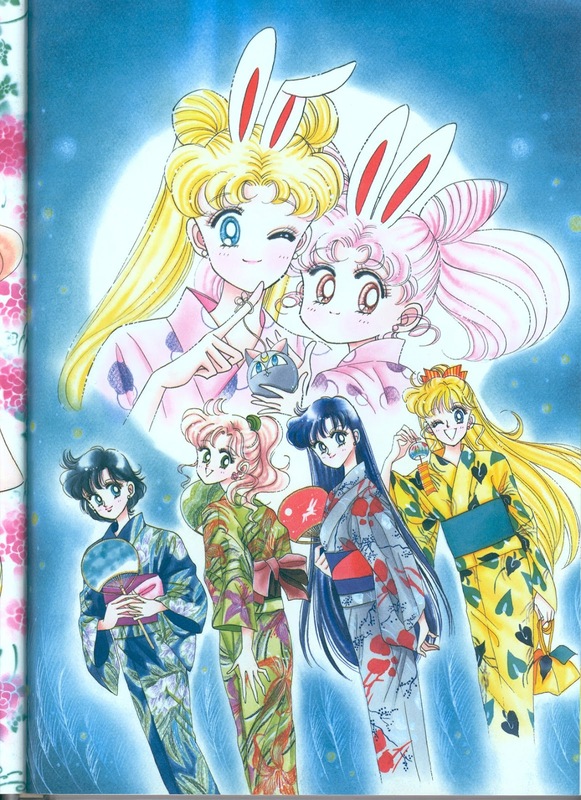 I found the illustrations from the Sailor Moon art books, but the only one that really resonated with me was Makoto's (can you guess why lol? ), and the rest just left me lukewarm. 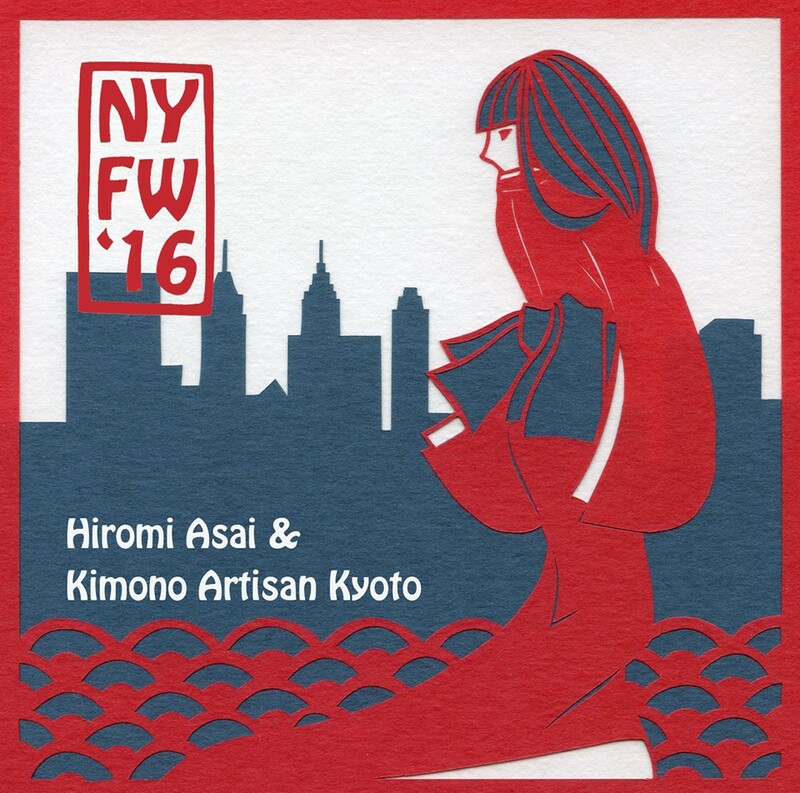 Yeah they are nice, but it will be impossible to find kimono that look like that, and I don't want to bother with making one. 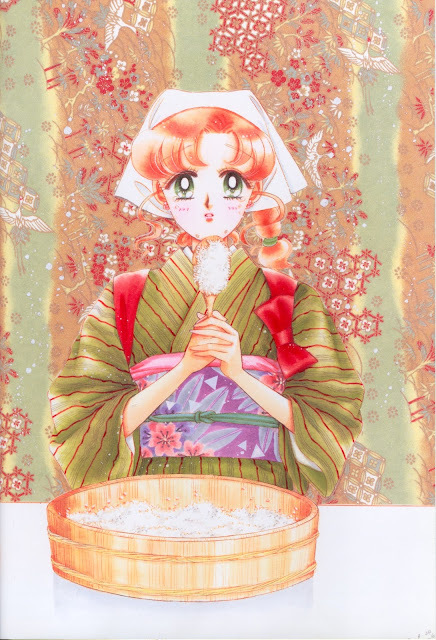 Hence Lyuba-style kitsuke. 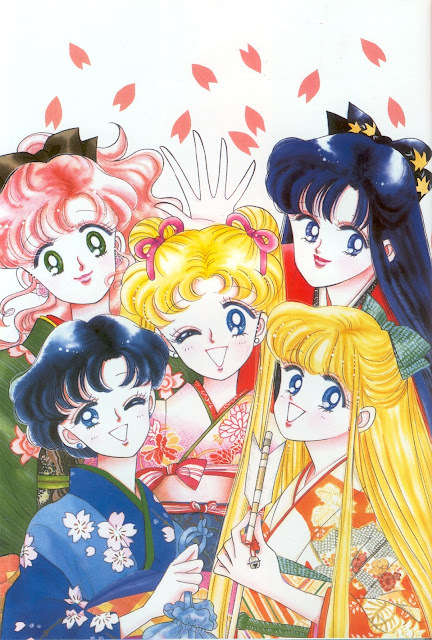 Ideally, I would love to get a group of Sailor Moon cosplayers together and dress them up. But that probably won't happen while I'm in the UK, because, although I'm confident I'll find the cosplayers, I have no place to change. I don't go to conventions here enough to get a hotel room anywhere, and I doubt anyone will come to my in-the-middle-of-nowhere-and-no-train-station-nearby house, nor am I going to drag full 5 outfits to who knows where. Realistically, I see this happening when I'm back in the USA, and when I go to the DragonCon (a convention that my husband and I decided would be our annual con). Ideally, I would love to style each outfit with stripes, but I don't really see that happening. I already pretty much wore what I could see as Minako's outfit, and it's not stripes. But then who knows? Maybe by the time I'm back in the USA, I'll get more striped kimono to choose from. Until then, here are the inspiration illustration I found online. What do you think about this idea? Yay or nay?